I’m sorry I’ve been a bit behind on the blog but Summer holidays are in full swing and our weekends have been busy so far with little time for writing. So far our Summer has been fun and relaxing with the kids enjoying each other’s company and having loads of fun. But this hasn’t just happened by accident. I have spent some time thinking of how I will get through the days with all four kids at home and keeping them happy, busy and relaxed. This year we have no holiday plans away so we’ll be making the most of our time at home. We live in amongst the beautiful countryside with plenty to entertain. But it’s easy to for kids to wear themselves out and start arguing over who took the last strawberry. So to keep things simple and fun here is my little routine to get us through the Summer. 1. Eat breakfast together as a family. With no tight, busy morning schedule to stick to we can take our time at the breakfast table and we’ve been enjoying some extra yummy one’s. American pancakes are a big favourite for our kids and they can make the batter and flip the pancakes too! We’ve been enjoying our extended breakfasts with lots of giggles and funny stories to share. 2. Have some quiet Bible time. Normally we run through some Bible versus at the breakfast table but now we’re reading through a little kiddy version of My Utmost for His Highest. The kids are doing so well at sitting altogether, listening and sharing. Building a love for the Word is something to treasure. 3. Quiet time during nap time. My youngest still takes a nice big long midday nap and I find all the other kids have a big dip in energy at this same time. We’ve watched a few movies but some days I even get them all into their beds for a little nap. The whole house goes quiet and all of us get the rest we need to make it through the afternoon. 4. Outside in the afternoon. I’m not very big on going out with all the kids. I find it very exhausting and expensive, but I do want my kids to enjoy the Summer while it lasts so I get them to play outside for most of the afternoon. I’ve noticed that they like to be outdoors from around 3pm onwards as it is just a bit too hot for them until then. 5. Stick to the same bedtime routine. Over the half term breaks I get so relieved that to have a nice break that I can really let things slip when it comes to bed time. But I’ve learned that this makes them more grumpy and tired and starts to bring on a lot more whining when you do try to finally get them into bed. So we had given them a Summer bedtime of 8 o’clock (rather than 7) and have tried our best to stick to it. Also making sure they have that same wind down time in the bath and with a good story to help them ease into sleep makes all the difference. Now we’re off to enjoy the sunshine outside! 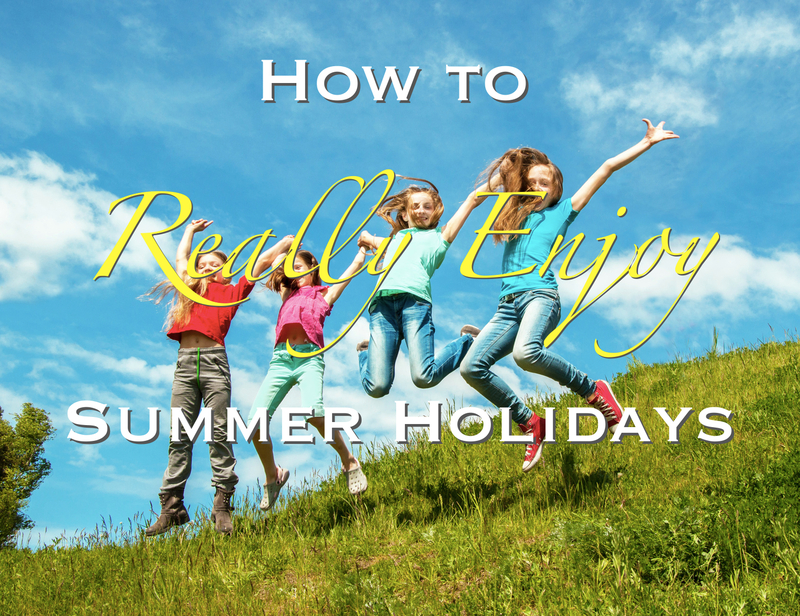 What are your Summer holiday tips? Growing up I had no affinity to children. I didn’t enjoy babysitting or helping in the creche. I didn’t go all doey eyed over a newborn and I had never even thought about having my own some day. But God had another plan for me and as soon as I was married we started talking about expanding our family. With every baby that came along I knew that God was giving them to me as a gift and that he had a great plan for them. But I know that he has a plan for me in raising them as well. My children have taught me so much about my character flaws, my strengths and weaknesses, my passions and deep desires. We’re into the second week of summer holiday’s and have just had an incredible weekend away at church camp and I loved every minute together as a family. 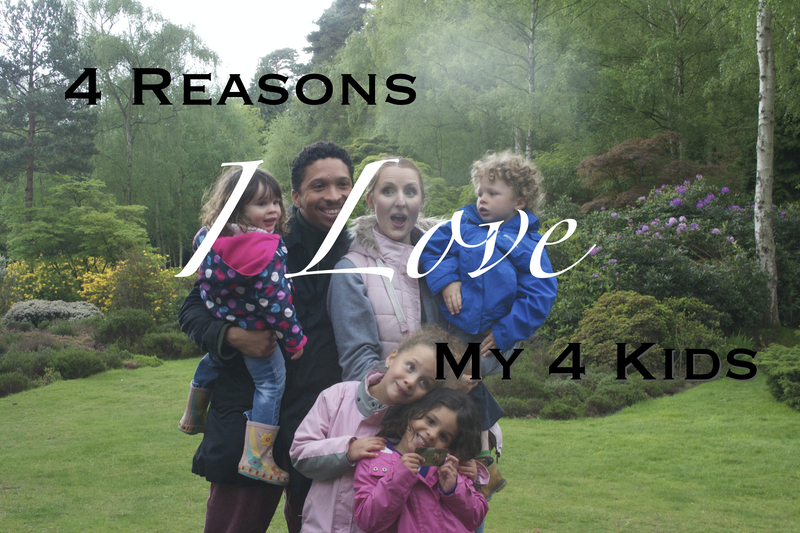 So I thought I would share the things I love the most about my children. 1. They’ve taught me about unconditional love. I never understood how Christ could have loved us unconditionally until I had children. The love is unparalleled and still astounds me. 2. They give me new mercy every morning. No matter what has happened the day before, we all wake up with a whole new love for each other. 3. They make me laugh every day. Kids are soooooo funny, from their hilarious statements, strange questions or explanations and crazy expressions. 4. They’ve taught me patience. The more children I had the more patience I certainly needed, but I actually surprised myself when I had my first baby at how patient I was with her. I am actually a very impatient person and like to live life in fast forward, but my children have taught me that patience really is a virtue and that the kindness comes from patience. Have you ever wondered what all the fuss about Jesus is? Do you find it hard to lift your hands in worship, sing at the top of your lungs or pray out loud, tithe in church and live your life by Jesus’ example? Why do we do all this? What’s the point? I was reading in Numbers today (yes, it’s August and I’ve only made it to Numbers!). Not the most inspiring book of the Bible, it’s God’s law written down in every single detail. And boy – are there a lot of details. A rams head for this, an unblemished calf for that, a bit of wheat flour and clay for that and a little goats blood for this. Clothes, food, marriage, adultery, murder, stealing and on and on – each one had a written law and way of coming to God to ask for forgiveness. It’s tedious to read, but how much more tedious it must have been to live by! When I was a teenager I loved God, but couldn’t understand how other’s seemed so thankful for Jesus dying on the cross. Why some would cry every time they worshiped God or read the Bible out of pure gratitude and thankfulness. How do you serve a God when you feel he hasn’t done anything for you? But Jesus did something for all of us, even if don’t know it. When Jesus died on the cross he removed the ‘curse of the law’ (Galatians 3:13). Living under all those rules and regulations was a curse of Adam and Eve’s sin. It made it almost impossible to live a holy life and be worthy of entering heaven. They had to watch every word, thought and action and if one was out of place they had to usually go kill something to say sorry. That’s pretty extreme and must have gotten incredibly tiresome. But Jesus’ death removed all of that. He was the ultimate sacrifice. The shedding of his blood was more than enough to sacrifice to forgive every sin for eternity. That’s why we Christians no longer slaughter sheep, goats and bulls and splatter blood and burn incense and spend weeks asking for God’s forgiveness. We are living in the freedom of Jesus Christ’s grace. That alone is something I will sing my heart out in thanks for! So REJOICE!! Be thankful to God that you are free to live life in the grace of his new covenant. You have instantaneous forgiveness of sins when you repent. You have immediate access to the throne room of God through the Holy Spirit. We all now get to enter into the ‘inner room’ for we have been washed by the blood of Jesus. So what are you thankful to God for today?? Are My Children a Blessing? We have returned home after a little mini break. And wow, was it refreshing. Good sleep, quiet mornings and lazy days was just the boost we needed before heading into Summer holidays with the kids. Coming home to our children was such a joy with all of them hugging, kissing and shouting out ‘Mummy, Daddy!’ at the top of their lungs. And of course they haven’t left our side since we returned. I was so blessed to hear that they had nothing but fun for the two days we were away. I am so thankful for our children. I look at them all and wonder how they got to be mine! If you don’t feel like that about your children taking some time to rest and realign can be helpful in showing you the things that matter most in your life. I love my children whole heartedly and they require every ounce of my energy, stamina and will power to raise them up to love the Lord. But they’re worth it. They’re souls in eternity is worth the 5am wake ups, the sleepless nights, milk spills, clothes stains, runny noses and endless questions. I am privilaged to have four healthy children. It is not my right. God has blessed me with them and I want to serve my God by serving my children in love to be an example of His love. So I want to encourage you this morning to love your children as christ has loved you, for he has given them to you as a gift. I have come back to my birthplace for a few days to celebrate our anniversary. As we were driving through Coventry God reminded me of the miracle of my birth. My parents were in England as missionaries, my mother was pregnant with me and their visa was running out to stay in the country. Moving around every day from town to town she only saw a doctor very sporadically and it was always someone different. Each time she had a check up she was told something was wrong with her baby – me! I was handicap, my heart was too small, one side of my brain was underdeveloped, there was no heartbeat and I was already dead and needed to be taken out. It all came to a head when she was in the Birmingham hospital and was lying in a bed with the doctor getting ready to perform an abortion convinced that I was dead already. She sneaked out of the hospital and went back to my dad and two brothers and just waited. She waited and waited and then had to induce her labour as my dad and brothers were days away from flying out of the country with their visa out of date. But then I was born. Three weeks early and only 5 lbs. God had done a miracle. He had preserved my life before I was even born. The devil tried to steal my life before I even had a chance to live it. I know that I am on this earth for a purpose. That I am called, chosen and appointed for such a time as this. There was no mistake about my birth. Today I am thankful. I am thankful for my feet that stand, my legs that run, my hands that bless and my arms that carry. I am thankful for the purpose I have in my life. I am not here by accident wandering around aimlessly. He formed me, called me, chose me and has sustained my life for his glory. My husband and I had four children by the age of 25. Living off of one salary at such a young age means there has never been hardly any money. We’ve been through a pretty long season of lack and at one point we got discouraged, frustrated and even felt hopeless about our finances. But then we came together in prayer and agreed that we were going to tithe more money. We had only been tithing 2% of our gross income, because we felt we couldn’t afford any more. But we decided to take a step of faith and tithe more to show our hearts towards God. We didn’t want to be ruled by our finances. It was all we thought about because we didn’t have very much of it. God showed me that if I can’t take care of my finances who better to do the job than Him?? In Malachi 3:8 God tells the people that they are cheating him. They didn’t understand how they were cheating God so He made it very clear to them. You have cheated me of the tithes and offerings due my name. 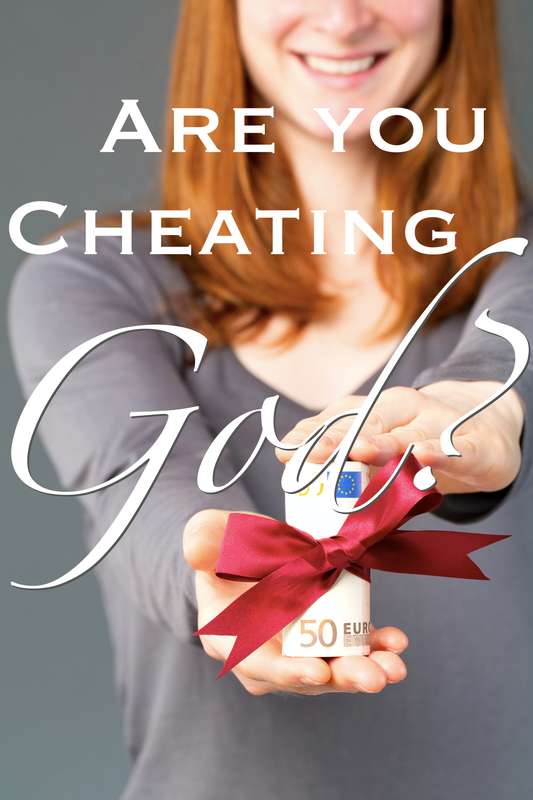 Did you know you can cheat God with your tithe? Tithing to God is not adding to his heavenly treasure chest. It’s a test of our hearts. And when we surrender our lives to him and tithe what is due his name he promises to open the windows of heaven and pour out a blessing so great we won’t be able to contain it (Malachi 3:10). Wow, that’s pretty incredible. Is this our view on tithing? Are we trusting God for his provision, blessing and abundance in our whole lives or are we just upset that we have to give away money we can’t afford? Tithing our money is only a portion of our tithe. Jesus fulfilled the law, so we are no longer required to give a set amount of money. Are we giving God our ALL? Or just the parts of us that we want? Tithing money is an insight into our heart attitude towards God. It’s is the one thing God says to test him in. But how can God expect us to tithe all the time? There was once a widow who was poor, very, very poor. And brought her tithe to church and gave what she had. It was all she had and it was still a tiny amount. But Jesus made her an example for all of us in Mark 12:43-44. She gave out of her need, not out of her surplus. So often we’re happy to tithe as long as we have enough left over. But what happens when there is nothing left over? Do we stop tithing because God will understand I need this money to pay bills? Giving God control over our finances is freedom from the love of money, which is the root of all kinds of evil*. Tithing is a Godly principle that changes our heart towards him and brings blessing and release into our lives. 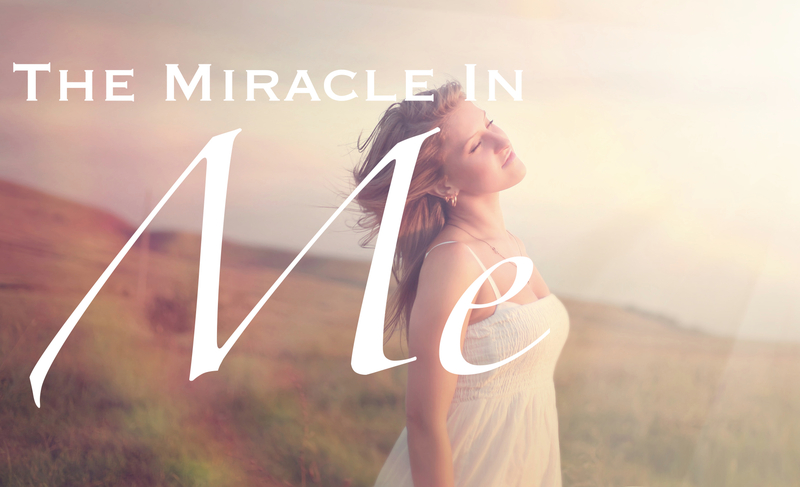 Are you lacking in an area of your life? Do you feel tied down by your finances? Take the step of faith and tithe out of your need, like the widow, and not out of your surplus and trust in God to provide for all of your needs according to His riches and glory. Phillipians 4:19. I don’t know about you, but I love going round to people’s homes. It’s such an insight into their world. And when you’ve been round to enough homes you will have run into issue like using the toilet that wasn’t flushed by the previous user, or the tea served with lumpy milk, or having to sit on couches covered in pet hair and milk spills. I have walked through homes where I could smell a dog and wait to have it leap up on me only to discover…there’s no dog. I’ve also been invited round to homes only to be ignored the whole time because they had to get all the chores done. This is the first step to making visitors feel like you want them there. Every home has an atmosphere that people walk into. If you’re not feeling up for guests they will sense that. Welcome them in with a smile and warm heart. It’s the biggest blessing and the best memory they’ll have from visiting your home. If you serve a cup of tea in your oldest, smallest mug with the tea bag left in it and tell them to do their own milk and sugar, again you’re sending the message that you’re not happy to see them. No matter how long or short someone is staying with us I always make a pot of tea and serve it on a tray with milk, sugar, biscuits (if available) and our best mugs. Now this may not always be possible, but this is a great advantage to keeping your house clew and tidy and eliminates a lot of stress when you have unexpected visitors. This is really the key to good company. If we stand on too much ceremony many times the room falls to silence. Be yourself and meet your guests wherever they are. If they’ve just come off an international flight show them to their room and give them time to rest. If they’re coming for a quick chat put the errands and chores on hold and give them your full attention. 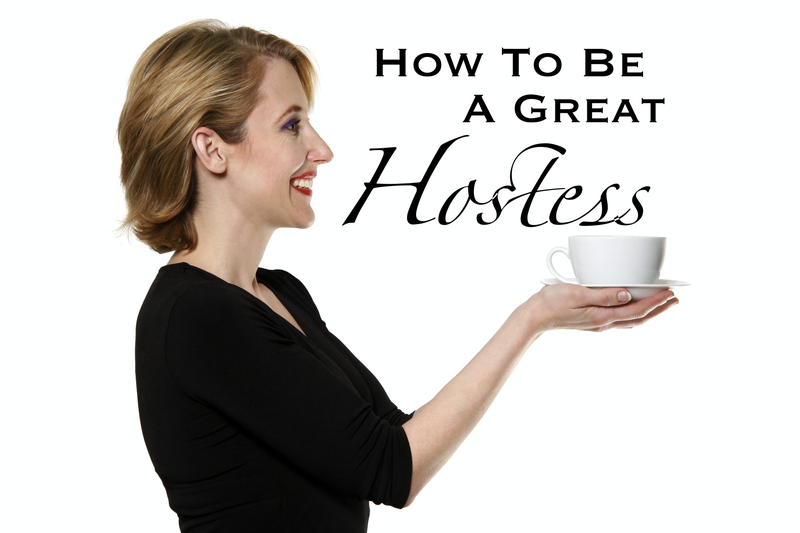 What are your best tips for being a great hostess?